If you could "reset" your immune system, you would discover how horrible childhood viral diseases are to adults. It occurs to me that one of the possible consequences of the anti-vaccine movement may be more adults getting childhood diseases. Perhaps this is already happening, or maybe it will happen in the future. The reason: in the past before vaccines, most people got childhood diseases during childhood. But with most people still vaccinating their kids, it might be possible for the kids of anti-vaxxers to make it through childhood without getting these diseases. But that doesn't mean they are out of the woods, because now they are an adult who is not immune to these diseases either through vaccination or having had it during childhood. That is a part of the "herd" effect of immunization. I do not have raw numbers of how the incidence breaks down, but the rise of measles in Europe is not all small children. One of the reason I get the "flu shot" is so I will not infect others. But then I am great like that. Yeah, that one seems a little bizarre. 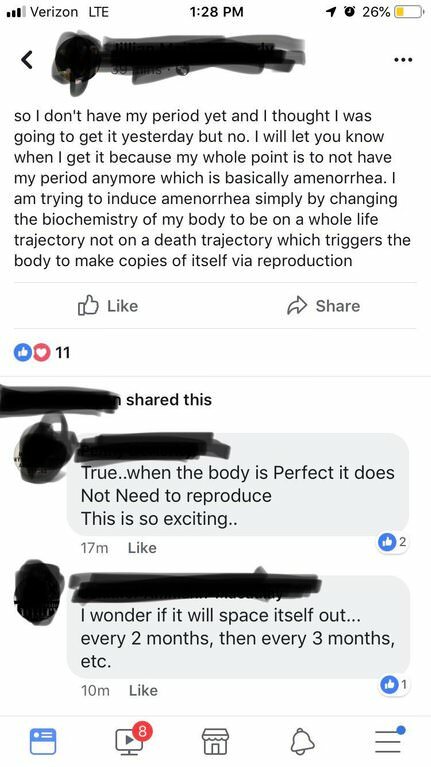 If she really wants to not mensturate though, or reproduce, I believe there are proven, widely used medical options available for her. They don't mean you will live forever, but they can stop mensturation and reproduction. Yep. Sew it shut and let it hair over.